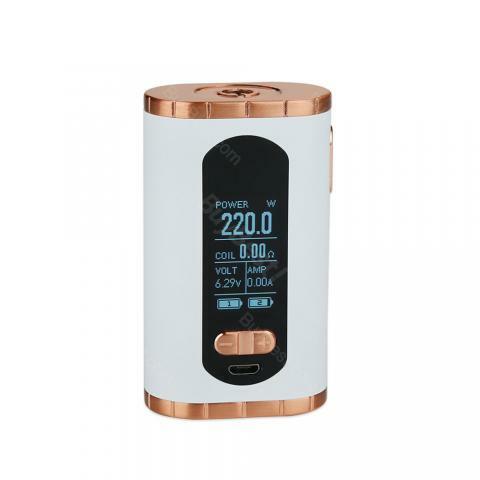 Eleaf Invoke is a 220W powerful TC Box MOD with centered 510 connection and 1.3-inch large screen. Powered by dual 18650 batteries with good performance TC/VW modes, Eleaf Invoke Box MOD makes your vaping experience to a new level. Eleaf Invoke TC Box MOD Powered by dual 18650 batteries, Invoke is an advanced and powerful TC MOD with compact size and ergonomic design. Invoke MOD fires up to 220W max output with high performance VW/TC(Ni,Ti,SS) to meet different vaping needs. Moreover, Eleaf Invoke 220W is compatible with most 510 atomizers with a centered 510 connection. Together with 1.3-inch display to show clear vaping status, convenient USB charging and upgradable firmware, Eleaf Invoke 220W MOD is absolutely a good choice for vapers. • Best match with Eleaf ELLO T Atomizer. Here is my review for the Eleaf Invoke 220W I just received last week from Buybest. First of all, the AUTENTICITY. I have checked the security code at www.eleafworld.com and the product is authentic, as seen in the adjoining image. UNBOXING: The box is strong and very protective, the mod arrived in perfect condition. It contained all the parts: the mod itself, the USB charging cable, the warning card and the user manual in a nicely designed box. ABOUT THE MOD: a remarkable feature is its lightweight ( only 77 grs. without the batteries). The buttons work real smooth and the spacious design of the top allows the eay use of 24 or 25 mm. Atomizers, as shown in the adjoined picture. Ideal for dripping and for cloud chasing. FIRMWARE UPDATE: it worked ok at the official site, updating to versión 1.20. Also the logo was updated. BATTERY LEAD: This is one major concern for me. With the open/close system I have not experienced problems in a week of hard use. But in my Eleaf Istick TC 200W, who has a similar system, the lead started to malfunction till I fixed it with a tutorial I found on the Internet. We will see what happens. DELIVERY: I bought this product in June 2018, but it took 8 months! In arriving home. It must be stated that it is not Buybest fault. The company shipped it super fast. The delay was caused by the Malfunctioning of Customs and Mail Service in my country. So nothing to complain about Buybest. PROS: the Invoke is a Little Handy mod that can be easily carried in a pocket when you go out. CONS: none at the present momento CONCLUSION: I am very satisfied with my purchase, the prize was conveniente and Buybest Customer Service answered my question fast and kindly. This mod is extremely handy and lightweight for 2 battery mod. My bigger berserker v1 looks perfect on it and batteries lasts forever on 9W!!! The mod fits my eleaf tank perfectly. The design of 220W Eleaf Invoke TC Box MOD is impressive and elegant. Fast shipping, careful package. I'd buy again. I gotta say it's a very good mod,whose clicky fire button, menu is easy to operate, and the mod is very light. It feels comfortable in hand and comes with a compact size compared with most dual battery mods. The large screen displays data very clear. All buttons are easy to press, Only the battery door seems not that sturdy but so far it works well. The Eleaf TC mod always in high quality,i like this brand.Best flavor and operate easily. One of the smallest mods, and the good thing of it is it feels good in hands. Not bad as a mod. Worth the value, I ordered this mod with an extra $10 gift card. Bravo. A present for my husband, trying to help him get rid of smoking, hope this helps. Box mod is my favorite,the Eleaf TC box mod give me a surprise.Fast delivery as expected, good quality and low price. Invoke doesn't make me disappoint. The mod fires up quickly, great hand feel to press the fire button. I love the TC feature most. Excellent quality, good looks, I recommend. If it has built in battery, that would be better. I have to buy two extra batteries for this Invoke mod. Beautiful black mod,i'll use my favourite tank with it.Large screen can display many datas clearly! Great Mod if you search a small one with dual 18650. Love this eleaf invoke, it's the most compact dual battery mod I've owned. Since receiving it, I've always carried it with me and vaped it constantly(2 months). It still works great. Definitely a solid mod worth your money!